The Arlington Police Department in Texas has released surveillance video from an ATM in hopes of identifying and catching a robber and kidnapper who forced an unsuspecting woman into her trunk earlier this month, CBS DFW reports. The kidnapping occurred at a drive-through ATM at a Wells Fargo bank Jan. 14, where the victim, choosing to be identified only as Christin, was withdrawing cash. Speaking to the news station, the 21-year-old woman said that the entire incident went down quickly. “It didn’t seem like it was planned. It was a crime of opportunity. … It could have happened to anyone,” she said. Surveillance video shows the young woman pulling up to the ATM and withdrawing cash. 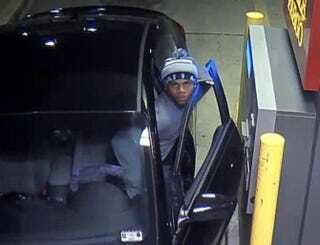 A man appears on the screen behind her car, around the ATM, and approaches the driver’s side. Christin told the station that she was ordered at gunpoint to get into the trunk before the man drove off in the car. Eventually the car stopped, and believing that the suspect had gotten out of the car, Christin opened the trunk via the emergency latch and ran to a nearby convenience store to call 911. “I thought maybe I have a chance of getting out of here. So I found the unlock from the trunk from the inside and I looked around to see if there was anyone nearby,” she told CBS DFW. The suspect is described as a black man, believed to be about 5 feet 6 inches tall and in his early 20s. He was wearing a gray jacket or coat and jeans at the time of the incident. Arlington police are asking for any tips involving the suspect.